Last Saturday we had the pleasure of entertaining my nephew Charlie. Charlie will be 3 at the end of the month so he’s more like Poppy and Elsie’s brother. We had a play outside and did some colouring in then we decided to have a little craft time. 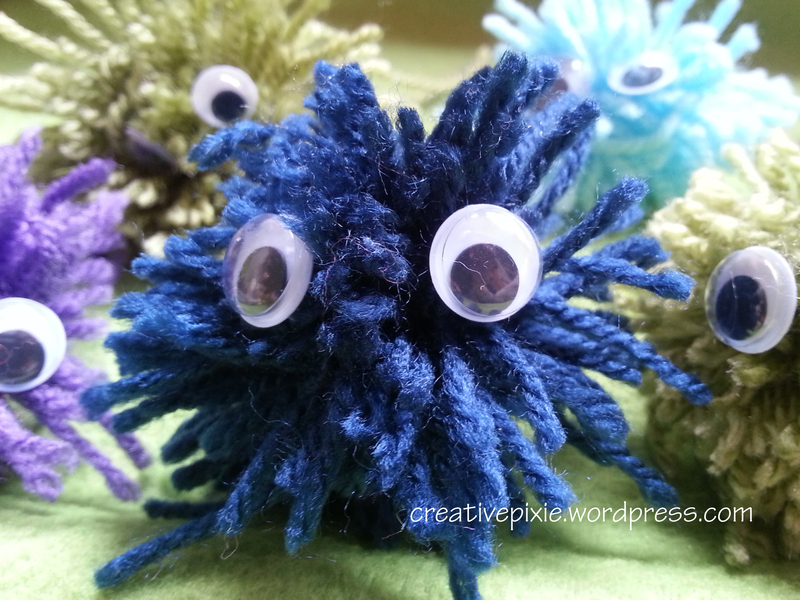 I got inspiration from Laura at Cute as a Button with her cute animal pompoms. I have plenty of wool so thought I could let the children use some. Laura recommended that instead of using circles of card (or forks – like I’ve seen on Pinterest) I could get the children just to use their fingers. Poppy chose some ‘girly’ colours like pink and purple, whereas Charlie picked green and dark blue as they were ‘dinosaur’ colours and Elsie bless her went for sky blue. Here’s a little tutorial if you feel like making some for yourself. 1. Cut a piece of yarn about 15cm long and put to the side for later. 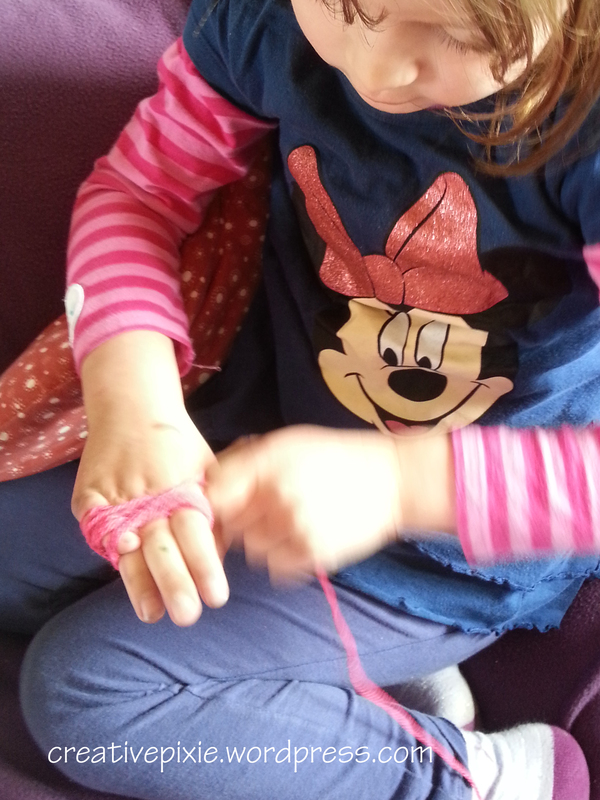 Start making the pompom by winding the ball of wool round your fingers until there’s a fat bundle of wool on there. 3. 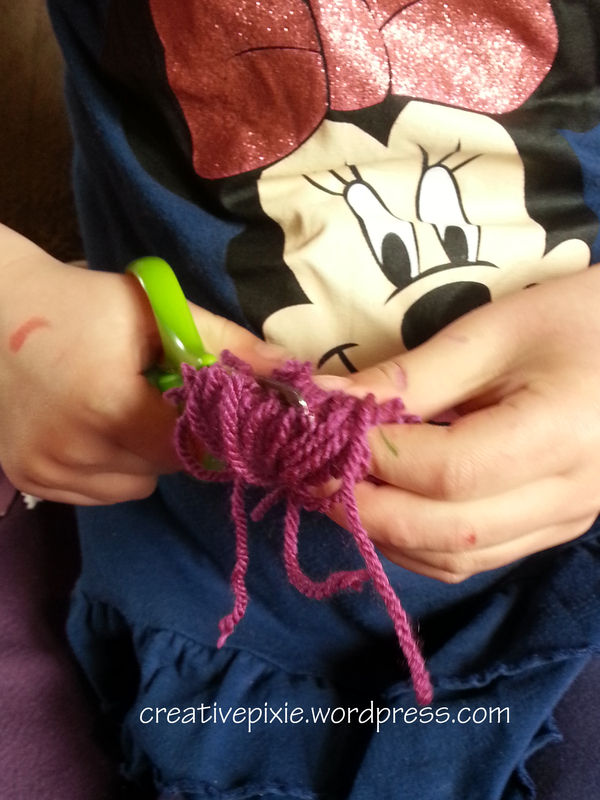 Get your scissors and cut the loops of yarn on both sides of the tied middle. 4. Fluff up your pompom so it’s a little ball of loveliness. 5. If you have some googly eyes, stick these on with some PVA glue and leave to dry. 6. When you’ve made one you’ll want to make loads in many colours, see Charlie’s ‘triceratops blue’ pompom above. What do you call a group of pompoms? 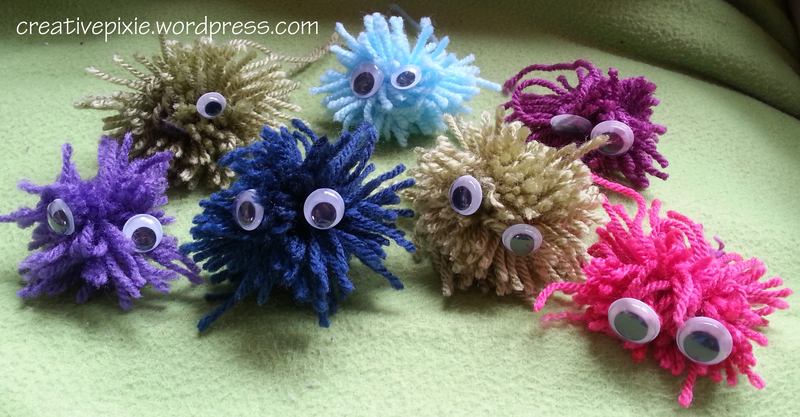 I’ll call them a gang – so here’s a gang of pompoms. I love Elsie’s teeny tiny blue one at the back. I love these, and the way there were done is so much easier for little ones. Yeah they were quite easy , no forcing a tiny ball of wool through a cardboard circle. Brilliant and soooooo much fun!! I would loooove to have one of those on my desk. Thanks. The children enjoyed making them and they’re not bad for their 1st attempt.